You Speak, We Listen » Embroidery Talk Has Moved! One of the best ways we know of finding out what products our customers want us to carry is by asking them. We ask quite frequently, either here on the blog, or when our customer service reps are talking to people by phone. It should be obvious that we want to stock products that our customers want to buy. It should also be obvious that stocking what customers want to buy is easier if you ask your customers what they want and then listen to their answers. One of the latest answers we got when we asked the question about what we should stock can be seen in the picture at left. American flag patches are a popular item and, since our parent company sells them, were also easy to add to the EnMart store. I’m confident our quality ranks with any patches available on the Internet, and I know our prices are certainly competitive. 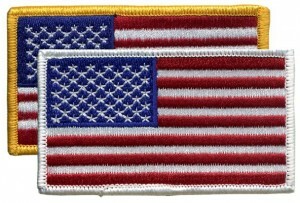 If you buy American Flag Patches on a regular basis, you should definitely give our flag patches a look. If you’re wondering what else we might be thinking of adding to the store, I can assure you we have a long list. We’re currently investigating sources for FR thread. We already have FR backing and will be adding that to our backing inventory soon. We’re also currently sourcing glow in the dark thread and colored metallic thread. EnMart is also developing kits for things like patch making and FR embroidery. We are very excited about the new products that are in the works and think they will all make great additions to the EnMart inventory. The best way to keep up with EnMart and to be notified when new products are added is to ask to be added to our mailing list. Everyone on the mailing list receives on electronic newsletter which goes out roughly twice a month. Another great source of information is this blog, and you can also keep up on the latest happenings at EnMart by following our Twitter feed. This entry was posted on Thursday, August 13th, 2009 at 1:00 pm and is filed under Shop EnMart. You can follow any responses to this entry through the RSS 2.0 feed. Both comments and pings are currently closed.